We believe unlocking earth’s nutritional wisdom is both an art and a science. We’ve applied both disciplines to develop our own unique, carefully balanced combination of nourishment for your pet’s overall health and well-being. 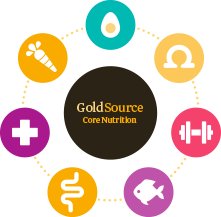 GoldSource Core Nutrition is at the heart of every dry dog and cat food recipe we make, and the start of the remarkable health your pet is sure to experience on a Solid Gold diet. The ingredients in GoldSource Core Nutrition are found in every dry cat and dry dog formula we offer, making for easy transitioning across our many delicious proteins! Egg – Nature’s perfect protein, with essential amino acids to support your pet’s muscle growth and metabolism. Few foods can beat the nutritional impact of eggs – high-quality protein and fat along with a wide variety of vitamins and minerals. Super Foods Inclusions – Nutrient-packed ingredients like carrots, pumpkin, cranberries, blueberries, broccoli, almond oil, kelp and lentils. Provide healthy fiber to aid digestion and are also rich in vitamins, minerals and nutrients. Vitamins C & E – Nature’s antioxidants to help support your pet’s immune system and long-term health. Ocean Fish Meal – A balanced protein to help support muscle growth as well as healthy skin and coat. Omega Fatty Acids – An optimum balance of Omega 3 and 6 fatty acids to promote immune system function plus skin and coat health. Protected Probiotics & Natural Prebiotic Fiber? – Help to support your pet’s overall digestive health and nutrient absorption. Natural prebiotics fibers feed the probiotics, which are protected in the cooking process, thus enhancing their positive actions. Taurine to support heart health. In cats, this amino acid cannot be synthesized in the body and is required to be taken in through their diet. While it is not essential for all dogs, added taurine is still beneficial for them. L-Carnitine to promote energy production, help burn fat and maintain muscle mass. In addition to our GoldSource Core Nutrition, Solid Gold dry dog and dry cat foods offer a variety of unique ingredients that serve a purpose! SALMON OIL is an excellent source of DHA, an omega 3 fatty acid important for brain and central nervous system development in growing kittens and puppies. DHA is also important for retinal health as well as skin and coat health. CANOLA OIL is an excellent source of omega 6 fatty acid that can aid in proper digestion and protein absorption as well as support your pets overall immune system. TOMATO POMACE is an excellent source of lycopene, a super antioxidant. HEALTHY WHOLE GRAINS brown rice, cracked pearled barley and oatmeal, to support a healthy digestive system. GRAIN AND GLUTEN FREE product offerings for pet’s with ingredient sensitivities. Always formulated for your pet’s optimal nutrition, what goes into a Solid Gold food is just as important as what does not.